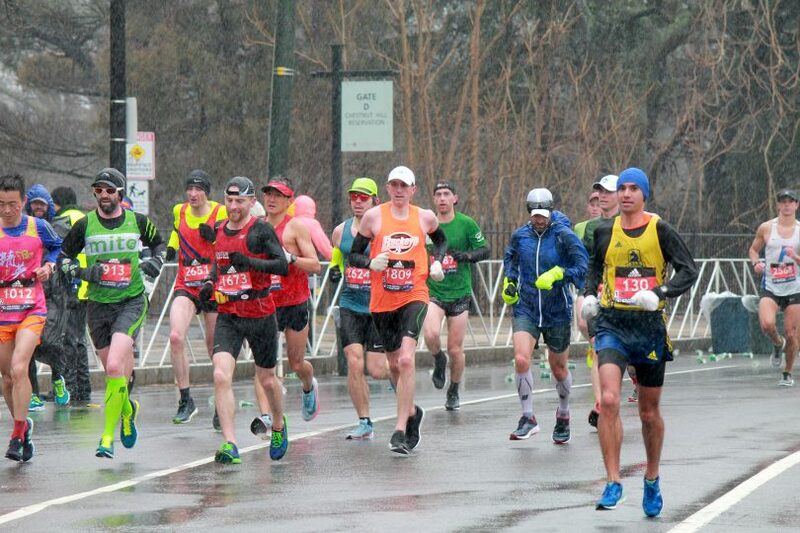 BOSTON — Boston Marathon organizer Boston Athletic Association, or BAA, lists two price tags on its marathon registration page: $200 for U.S. residents, $250 for those coming from abroad. But it takes more greenback for the 30,000-plus runners to reach the Boylston Street finish line on Monday. Susanna Kelland, 58, flew into Boston from Denver on Saturday — $400 for a roundtrip flight. Two nights at Hyatt Regency Boston and one at the Revolution Hotel amount to $1,100. For food and beverages, she said she tries to keep them at $100. The extra clothes for the potentially rainy weather? $200. With miscellaneous expenses, such as shopping for marathon novelties at the Boston Marathon Expo, Kelland’s total expenses for the weekend add up to $2,600. That’s roughly $100 for every of the 26.2 miles she’s running. “To run a marathon takes both money and time,” Kelland, of Manitou Springs, Colorado, told BU News Service. Kelland’s expenses in Boston only make up the froth of her preparation. To qualify for the Boston Marathon, her first time running it and sixth marathon, she had to run a BAA-approved marathon in under four hours and 10 minutes, the cutoff for her age group. In December 2017, Kelland ran the California International Marathon, a qualifying race for the Boston Marathon, in three hours and 55 minutes. Flight, car rental, hotel, food and marathon swag combined: $1,800. The California International Marathon, held in Sacramento, is a popular Boston Marathon qualifying race for its favorable course and low altitude, Kelland said. 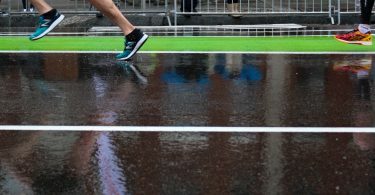 With rain and thunderstorms forecast for Monday in Boston, runners said they are bringing some of the winter running gear they used to train with. David Meyer, 62, is running his seventh Boston Marathon on Monday, on top of the 10 Chicago Marathons he’s completed. A resident of Grayslake, Illinois, Meyer’s no stranger to cold weather — he said he’s run 15 miles in 5-degree weather earlier this year. His investments include three pairs of running tights, each ranging between $100 and $130; a neck guard for $35; long-sleeve shirts for about $45 each, running jackets for $300 and gloves that cost $25 a pair. Running gear-makers often emphasize the lightness of their products — a clear advantage for long-distance runners. Meyer said he plans to wear a short-sleeve shirt, a Gore-Tex waterproof jacket, a pair of shorts, as well as a hat and gloves. Some runners BU News Service spoke with follow the Hanson’s Marathon Method, which gradually increases the weekly number of miles run over the course of 18 weeks. Others, like Jerry Canterbury, of Cary, North Carolina, hired a coach as they trained for the marathon. Canterbury’s coach charges a flat rate of $200 a month, and he said he has been consulting with her for about four years. On top of the coach fees and running-gear expenses, runners also have to brace for the unexpected. Canterbury said his hip was injured last year after running the race that qualified him for the Boston Marathon. To get back in posture, Canterbury had to see a physical therapist. “Mentally, it was a bit of a challenge over the last couple months,” Canterbury said. The Boston Marathon will be Canterbury’s ninth marathon. His other marathons completed include the Antarctica Marathon and several races in North Carolina. Runners often find time after work to train, or do longer runs on the weekend. But for some, the opportunity cost of missing work due to training is real. 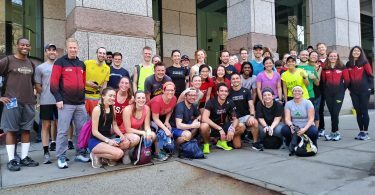 “When you run in the morning, [and] you’re gonna do a 15-mile [run], and you’re, ‘Ugh, I’m not going to work today,” Kelland, who works a flexible sales job at a publishing company, said. She said her recovery time is about 30 minutes for every mile. Runners can choose between cheap and expensive hotels or AirBnB rooms. Or choose to opt out of the spending spree at the Boston Marathon Expo. But the quality of shoes is not something runners can compromise with. Noel Colina, 59, flew in from Tracy, California, to run his sixth Boston Marathon — including the 2013 Boston Marathon, in which he crossed the finish line 20 minutes before the bombs exploded on Boylston Street. Colina said he booked his Somerville hotel room, which costs about $200 a night, as far back as November 2018, as it is cheaper than other accommodations in Boston. But with shoes, Colina buys a new pair for every marathon, keeping it for training in the following year. He said he’s used Hoka One One shoes, which cost $120 a pair. Kelland, who uses the $250-a-pair Nike Vaporfly 4%, said shoes are essential to surviving the entire course. The Boston Marathon is one of the Abbott World Marathon Majors, which include renowned marathons in Tokyo, London, Berlin, Chicago and New York. The World Marathon Majors, as well as other marathons held around the globe, have created the market for athletic tours. Marathon Tours and Travel, a Chelsea-based tour company with a focus on the World Marathon Majors, offers four-night VIP Boston Marathon packages that start at $1,245 a person. The package includes a hotel room at the Marriott Copley Place hotel, a pre-race pasta dinner — so as to stock up on carbohydrates before the marathon — and transportation from the hotel to the Athletes’ Village in Hopkinton. Gilligan said Boston Marathon runners, whose average age this year is 45, are generally “well-traveled” people. The tour company also offers services through other tour operators around the world, drawing in clients from about 50 countries such as Australia, Germany and Japan, Gilligan said. Travel companies often have special-price deals with major Boston hotels. The Dallas-based Fit4Travel, also a sports-travel company, maintains a contract through which it receives lower rates with the Boston Park Plaza hotel through 2026, Diane Golden, the company’s founder, told BU News Service. Golden said people are willing to pay a little extra for the Boston Marathon trips due to the race’s prestige.